MechWarrior: Dark Age (typically abbreviated MW:DA or simply MWDA, and retitled for its second major expansion as Age of Destruction, MW:AoD) was a tabletop miniatures wargame by WizKids set in the BattleTech universe. MWDA came with its own, all new line of novels, sourcebooks, and an in-character website called LinkNet. Although extremely successful, MWDA was discontinued in 2008 after WizKids had been sold to the Topps company. 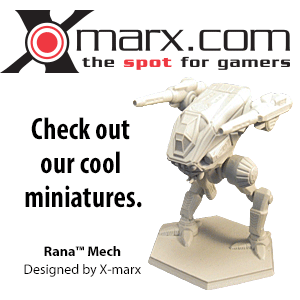 Released in 2003, this new game was a new approach to the BattleTech universe. With its first plot-driving novel set in 3132, MWDA was set loosely a century in the future of the year 3067 where the classic BattleTech line had left off at the conclusion of the Civil War era. The MWDA plotlines made reference to a highly devastating "Jihad" era that had shaken the universe and set up the MWDA setting, but gave relatively little detailed information. The original boardgame was meanwhile rebranded "Classic BattleTech" and the license went to FanPro with the caveat that they could not advance the timeline, so as to not create canon inconsistencies with the future as described in MWDA novels and sourcebooks. Also, FanPro renamed the MechWarrior RPG series to prevent confusion with the new game, reprinting MechWarrior, Third Edition as Classic BattleTech RPG (and later A Time of War for the 4th edition). The classic BattleTech line would outlive MWDA and evolve its timeline through the Jihad well into, and beyond, the MWDA setting in the 32nd century, creating one single connected history for the BattleTech gaming universe. MWDA was based on WizKids' Clix system that tracks damage and other stats on dials in the base of the playing pieces. The miniatures were pre-painted models of infantry squads, Battle Armor, vehicles, and 'Mechs. Unlike Classic BattleTech, it was meant to be played on hexless terrain from the onset. The game was mainly purchased in blind booster packs (similar to Magic: The Gathering), but pre-packaged "Action Packs" also existed with units gathered around a common theme. Outside of direct purchasing, trade is the most common option for acquiring figures, followed by purchases on online auction sites. There are units that were only acquired through trade or send-aways, such as the Battleforces and the Designer Series 'Mechs and pilots. In addition, independent mercenary units were also present in the game; these units were represented by figures with no affiliation on their base. Over time, these factions acquired their own particular style of play. For example, the repair ability of the Bannson's Raiders units lend themselves to quick strikes followed by a retreat. Three factions (House Liao, Clan Jade Falcon, and Clan Sea Fox) have inherent abilities not stated on their figures. Examples of these abilities include improved damage to elite or novice enemies, better targeting through forests, improved jumping attacks, or gaining the ability to deprive an enemy player of an order. This concept has been extended in later expansions by the addition of faction pride cards and special pilot abilities. Starting in January 2006, the faction abilities for House Liao, Clan Jade Falcon, and Clan Sea Fox were replaced with faction pride cards. One of the most interesting aspects of MechWarrior: Dark Age is its relation to the Classic BattleTech game. 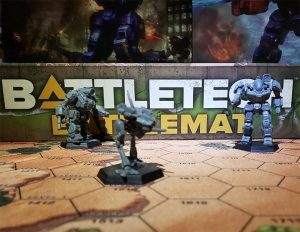 In the first expansions of the game, Wizkids tried to make MW:DA a simplified version of BattleTech, with many of the 'Mechs capable of being easily converted to their pen and paper BattleTech equivalents. With the release of Age of Destruction, though, Wizkids, starting developing new 'Mechs that were no longer based in the Classic BattleTech conception of a 'Mech and did not conform to classic construction rules. For example, while the Shen Yi of older expansions had a card that assisted in translating it into a Classic BattleTech 'Mech, the new Shiro is not strictly compatible as a Classic BattleTech 'Mech. While many fans of the game applaud the creativity Wizkids has in making 'Mechs outside the box, a fair number of fans were very dissatisfied with departure from the traditional rules regarding 'Mech design. MechWarrior: Age of Destruction introduced new rules and new mechanics to the game, most notably the pilots and gear data cards. These cards are included with the booster packs, and improve any 'Mech they are attached to. This also introduced Gunslingers, mercenary pilots with preferred 'Mechs that can be "recruited" to all, or most, factions. They have become common prizes at sanctioned tournaments. MechWarrior: Dark Age (August 2002) - The original set, available as a starter pack and boosters. MechWarrior: Fire For Effect (February 2003) - Introduction of artillery, transports, and mercenaries. MechWarrior: Death From Above (May 2003) - Adds VTOLs and AA defense systems. Republic of the Sphere and Stormhammers introduced as playable factions. MechWarrior: Liao Incursion (September 2003) - House Liao becomes playable faction. Introduction of faction abilities. MechWarrior: Counterassault (January 2004) - Introduction of positive heat dial modifiers. MechWarrior: Falcon's Prey (August 2004) - Last Dark Age set. Clan Jade Falcon introduced as regular faction. MechWarrior: Age of Destruction (January 2005) - Available as a starter pack with revised rules and units. MechWarrior: Firepower (May 2005) - Introduces House Kurita and mail-in offer 'Mechs as part of tie-up with Wizard Entertainment. MechWarrior: Annihilation (November 2005) - Introduces Clan Nova Cat; last expansion with Dark Age splinter faction units. MechWarrior: Vanguard (May 2006) - RISC gear cards introduced (available in certain Unique 'Mechs only). Last set with mail-in 'Mechs. In early 2006, WizKids released the Battleforce series, which consists of pre-packaged sets of 'Mechs painted to represent normal service units from each major faction. They come with pilot cards that depict ranked pilots from the faction. MechWarrior: Clan Jade Falcon (January 2006) - Contains 2 Shrikes, 2 Eyries, and 2 Gyrfalcons, plus pilots. MechWarrior: Republic of the Sphere (May 2006) - Contains 2 Malices, 2 Mangonels, and 2 Nyxes, plus pilots. MechWarrior: War College (Summer 2006) - This set was designed to help attract new players to the game. Contains a Unique Atlas and Marauder IIC 'Mech and their pilots, plus a playmat, two sets of dice, and 18" tape measures. Only available at War College events. Ares 3-Pack (Debuted at GenCon 2006; general release September 2006) - This set marked the debut of the Colossus-Class Mechs. The robots and their accompanying gunner, pilot, and engineer cards are named after figures in Greek mythology. Their tripod shape is reminiscent of the alien robots in The War of the Worlds. MechWarrior: Phantom War Battleforce Set (September 2006) - A product tie-in with the Nintendo DS game MechAssault: Phantom War, the set features units from House Steiner and Clan Hell's Horses. The Steiner side comprises a Raptor, Uziel, and the Unique Atlas "Unsterblich". The Hell's Horses are represented by a Unique Hellbringer (Loki) "Brimstone", a Timber Wolf (Mad Cat); a revived sculpt from the Dark Age sets, but presented as a first model Mad Cat, not a Mad Cat Mk II), and a Kit Fox (Uller). MechWarrior: Poseidon (October 2006) - Contains the Ares BattleMech Poseidon and two infantry pieces, plus their cards. MechWarrior: House Davion Action Pack (May 2007) - Contains 2 Atlas, 2 Templar, and 2 Enforcer III mechs with pilots for House Davion. MechWarrior: Champions, Volume I Action Pack (June 2007) - Containing Ghost, Jupiter, Locust, and Mortis BattleMechs with pilots based on the Top Four fellowship players of the 2006 MechWarrior Fellowship World Championships. A 'Fellowship' in Mechwarrior parlance can be loosely described as a sportsmanship award. MechWarrior: Champions, Volume II Action Pack (July 2007) - Containing Raven, Griffin, Warhammer IIC, and Daishi BattleMechs with pilots based on the top four champion players of the 2006 MechWarrior World Championships. MechWarrior Solaris VII: Assault-Class Action Pack (August 2007) - the series features 24 Gunslinger mechs that do combat on the gaming planet of Solaris VII. The mechs, plus their corresponding pilots and equipment, are grouped together in every pack according to each of the four weight classes - Light (eight), Medium (six), Heavy (six), and Assault (four). Each pack contains a rulebook, a set of six target tokens, and a playmat that can be connected with those from the three other packs to form one giant arena map. MechWarrior: Undead Lance (October 2007) - A set of gunslingers that are based on the Four Horsemen of the Apocalypse. MechWarrior: Wolf's Dragoons Wolf Spiders Action Pack (November 2007) - Includes four heavy 'Mechs (Loki, Mad Cat IV, Vulture IV, and Thor) painted in the colors of the Wolf's Dragoons mercenary unit's Wolf Spiders battalion and their corresponding pilot cards, plus a Jaime Wolf pilot card. MechWarrior: Gamma Regiment Action Pack (December 2007) - Includes two ’Mechs, three vehicles, and six infantry pieces of different models, plus a set of pilot cards. Both the Wolf Spiders and Gamma Regiment sets have pilots with combat abilities that can be used in other mechs. Previous pilot abilities were only activated in the pilot's preferred Mech, due to the familiarity with the machine. In GenCon 2007 WizKids announced the production of a Solaris VII champions set, coinciding with the six Players who had won the Solaris VII Open Worlds Event hosted that year. However, due to issues in production, the Mechwarrior line was put on permanent hold status, and the Solaris VII Champion set was never produced. WizKids did however, create a set of custom 'Mechs based on existing sculpts for the six Champions, they are the only known Solaris VII Champion 'Mechs produced, but did not come with pilot cards. In cooperation with Gale Force Nine, Wizkidz introduced a line of 3D terrain sets. In 2003, WizKids produced a special DropShip playset. Sold only at conventions and through special promotions, the Aurora DropShip is a massive unit that has four cannon turrets and four bays for repairing units. The playset also has special rules. This page was last edited on 7 May 2018, at 06:10.